Technicolor Kitchen - English version: Lime butter drops with coconut + "Breaking Bad"
Lime butter drops with coconut + "Breaking Bad"
Cookies: put the sugar and the lime zest in the large bowl of an electric mixer. Using both hands, rub the sugar into the zest. Add the flour and salt and, using the paddle attachment, mix on low speed for 30 seconds. With the mixer running on low speed, gradually add the pieces of butter. When the mixture begins to look like crumbs, add the vanilla. Gradually add the cream cheese. When the dough starts to clump together, turn the mixer off and finish mixing with a spatula, until all the ingredients fully combined. Roll 1 leveled tablespoon of dough per cookie into a ball and place it onto the prepared sheets, 2.5cm (1in) apart. Gently press the ball. Bake for about 15 minutes, or until golden around the edges. Transfer to a wire rack to cool. Glaze: it the bowl of an electric mixer fitted with the paddle attachment, combine the cream cheese, the lime juice, and the confectioners’ sugar. Mix on low speed for 30 seconds. Increase the speed to medium and mix for 2 more minutes. The glaze should be as thick as glue – add more sugar or more juice if necessary (I had to add 25g of sugar to get the right consistency). Spread the coconut on a plate. 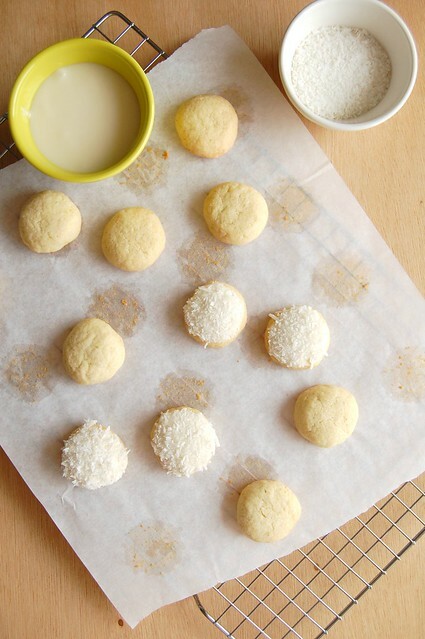 Dip the top of each cookie into the glaze, dip into the shredded coconut, and let set for 20 minutes. What lovely little drops! I might have to try a version with meyer lemons :). She, I'm so glad to hear the recipe turned out good for you! Thank you for letting me know!